Of the 84 schools and programs served by our growing ESOL program, 52 of them are elementary schools. Midland Park Primary has the largest population of English Language Learners (ELLs) with over 60% of their school population being English Language Learners. Each ESOL teacher on the team is a dedicated professional who is an outstanding teacher and an excellent ambassador for the English Language Learners and their families in the community at large. They meet with parents after school and at home in an effort to ensure the lines of communication are open and clear. Should you need to contact one of the teachers, please call the ESOL Office at (843) 574-2199 and we will relay the message. Of the 84 schools and programs that we serve, teachers travel daily to 21 middle schools in Charleston County. The language abilities of the ESOL students are diverse as they represent 60+ languages and many different countries and cultures. Some students arrive speaking no English while others are almost fluent and need little or no service. Our teachers assess their language proficiency to determine the students' needs based on a LAS (Language Assessment Scales) test. Parents are notified of testing and results. Most parents take advantage of the wonderful opportunity for their children to learn English in a more accelerated fashion. Our largest middle school populations include Northwoods, Morningside Academy, Haut Gap and Zucker. CCSD educates English Language Learners in 14 area high schools from North Charleston to West Ashley to East Cooper. This group of students serves as ambassadors of their culture to the community at large as they seek to establish their future goals. CCSD strives to create a learning environment that encourages students' pride in their cultural heritage along with the cognitive and effective support to help them become contributing members of our society. In all area high schools, English Language Learners (ELLs) may take English classes to enhance their reading, writing, listening and speaking skills. At West Ashley High School, Stall High School, and Wando High School we offer an ESOL English class for credit. Students at these schools are able to study English both semesters of the 4 x 4 block to improve their language acquisition. In the fall, they study ESOL prep followed by the core course in the spring. This intensive course of study accelerates the learning process and prevents the learning gap that can occur when studying language on a 4 x 4 block. 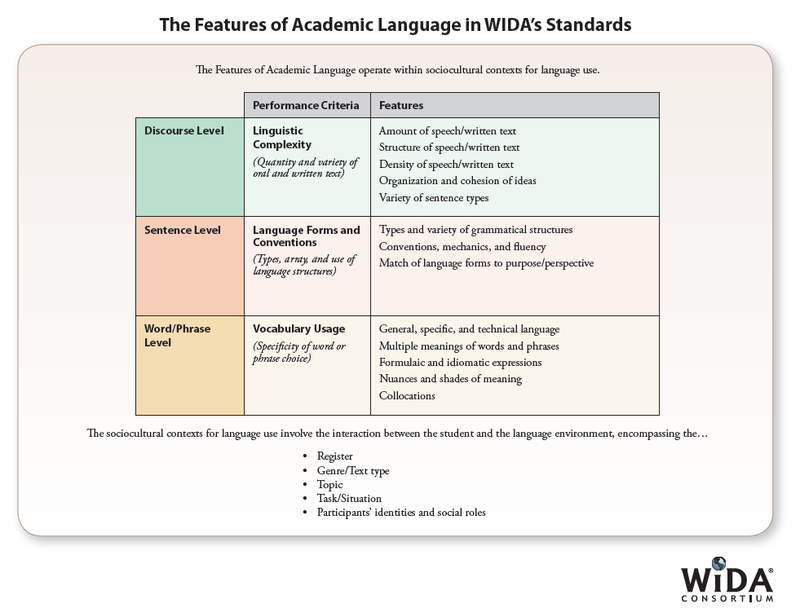 South Carolina adopted the language proficiency (ELP) standards developed by the World-Class Instructional Design and Assessment (WIDA®) Consortium in July, 2014. Charleston County Schools uses the WIDA ELP Standards as a basis for providing services to ELLs. English language learners communicate information, ideas, and concepts necessary for academic success in the content of Social Studies.